Watson was born in Chicago, Illinois. He was an extremely intelligent child and used his photographic memory to his advantage. By age ten he was a regular contestant on a popular radio show called The Quiz Kids. He studied zoology at the University of Chicago when he was only 15 years old. By age 19 he was conducting research on viruses at the University of Indiana, where he earned his doctoral degree. He continued his virus work in Denmark for a short period of time before several scientists convinced him to concentrate on genetics and molecular biology. This new direction led him to Cavendish Laboratory at Cambridge University in 1951. It was here that he first met Francis Harry Compton Crick (1916-). A friendship soon developed between Watson and Crick. It didn't take long before Watson's enthusiastic approach to genetic research persuaded Crick to assist him in developing a DNA model. During this time DNA research was not a high priority for most scientists. Watson and Crick entered the race to find the structure of DNA rather late. With the odds stacked against them, Watson and Crick proceeded to develop their own hypothesis. They believed the DNA structure was actually made of two parallel strands. They obtained structural working models and attempted to fit the pieces together using proven chemical laws and prior studies. Many times the model, which resembled a large tinker-toy ladder, fell apart or simply did not fit previously established evidence. The researchers tedious task was somewhat like trying to put together a model airplane with only a small portion of the instruction sheet and no picture of how the assembled plane should look. Finally, two major clues fell into place. Watson and Crick knew that the amounts of the base pairs of amino acids (protein elements) which connect the two strands of the DNA molecule, were about the same size and shape. Information supplied by Maurice Wilkins and Rosalind Elsie Franklin also suggested that the sugar-phosphate part of the structure was on the outside of the model. Watson noticed that the base pairs fit neatly into the overall twisted ladder or double helix form without any distortion. It also meant that each side of the ladder fit into the other. This explained how DNA could be precisely copied each time a cell divides. The completed model consisted of a double backbone of sugar and phosphate molecules arranged in repeating units. Between these, like rungs in a ladder, were the flat pairs of bases. In 1953 when Watson was only 25 years old, he and Crick announced their discovery. Almost ten years later, after numerous tests confirmed their results, the research team shared the Nobel Prize with Maurice Wilkins. Today we know that DNA is the molecule that contains the essential set of directions that each cell needs to perform vital life functions. The details of the DNA molecule are so precise that differences in the microscopic structure could mean the difference between a man and a mouse, or between life and death. 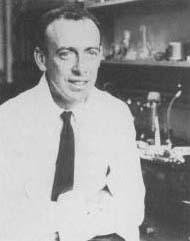 Since the DNA discovery Watson has published numerous papers, written several genetics textbooks, and taught at the California Institute of Technology and Harvard University. Watson divides his time between two demanding administrative positions. He is director of the prestigious Cold Spring Harbor Laboratory in New York (an institution involved in genetic and cancer research). Since 1988 he has also been a director of the human genome project. The goal of this endeavor is to eventually identify all of the 50,000 to 100,000 human genes. Watson believes that this will make it easier to identify individuals who are at risk of developing a variety of genetically caused diseases. I officially third that. That poor Rosalind, she put, Oh, so much effort, into all these vigerous studies, and her partner and the copycats get the prize! ?